,Foster Farms Introduces QR Code Virtual Assistant on Poultry Packaging-FoodSourcings(Chinese Food)- Global food industry trade B2B marketplace, provide suppliers, products and related news information. Foster Farms introduces DORI, an interactive on-package QR code that is designed to make shopping for chicken easier. In a friendly emoji style, DORI connects consumers to exclusive savings, fresh chicken recipes, a guide to poultry labeling terms and more. DORI is accessible via smartphones wherever Foster Farms fresh chicken is sold. 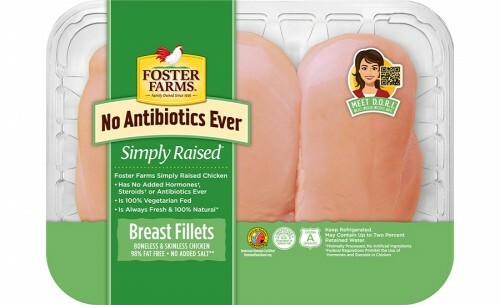 The new "virtual assistant" debuts across all Foster Farms fresh chicken lines including Fresh and Natural, Simply Raised and Organic products. According to a study from Juniper Research, approximately 1.3 billion QR code coupons were redeemed via mobile phones in 2017. This number is expected to grow to 5.3 billion by 2022. DORI is paving the way for greater access to information and savings in the fresh poultry case. Foster Farms expects to expand DORI to all its other product lines by 2019.